Find artworks, auction results, sale prices and pictures of Robert Gavin at auctions worldwide. 61 x 51cm (24 x 20 1/16in). Captivated by the exoticism and mystery of North Africa and the Middle East, many European artists during the mid-late 19th century travelled to North Africa and the Middle East for artistic inspiration. 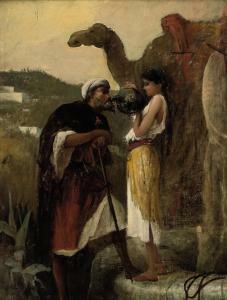 The Orientalist genre developed from Romanticism, sharing a concern for human emotions, the human form and a fascination for the perceived 'uncivilised' cultures of the Orient. 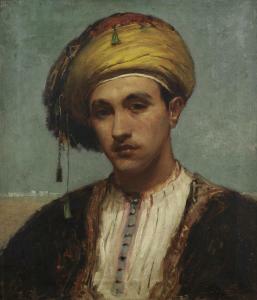 Born in Leith, Scotland, Robert Gavin was one such artist, spending a number of years in Morocco observing and painting Moorish life, primarily portraits. The present lot reflects the curiosity of the European Orientalists, showing particular interest in the colours and textures of the sitter's exotic costume. Although there no proof, it is possible that this is a self-portrait of the artist; Orientalist artists, such as John Frederick Lewis (1805-1876), often painted themselves in Oriental costume. Captivated by the exoticism and mystery of North Africa and the Middle East, many European artists during the mid-late nineteenth century travelled to North Africa and the Middle East for artistic inspiration. The Orientalist genre developed from Romanticism, sharing a concern for human emotions, the human form and a fascination for the perceived 'uncivilised' cultures of the Orient. 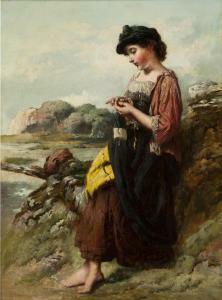 Born in Leith, Gavin's work displayed much in common with the Scott Lauder group before he moved to New Orleans in 1865, and thereafter to Tangiers. 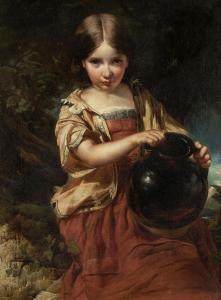 It has been suggested that the present lot is a preparatory oilsketch for the larger work of the same title in the Walker ArtGallery, Liverpool, and illustrated in Edmund Morris' 1996 bookVictorian and Edwardian Paintings in the Walker Art Gallery and atSudely House, volume 2, pages 163-164.